Learning how to speak a new language can be extremely difficult. Learning how to write in a language that's not your mother tongue can prove to be even more challenging. If English is your second language and you are struggling to write reports, letters, applications, business correspondence, and other important documents in English, then you should take advantage of the English language learning benefits of WhiteSmoke's premier English grammar checking software. 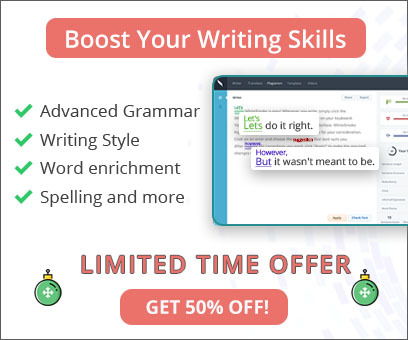 Our one-of-a-kind software will proof your writing, checking it for grammar and punctuation errors as well as stylistic mistakes. It also serves as a top-of-the-line spell checker. If English is not your native language, then you've probably picked up on the fact that English is not the easiest language to learn. There are so many silent letters and conjugating exceptions – enough to make even native English speakers confused! It's no wonder that you're getting frustrated with your English writing! Our grammar checker will catch grammar and stylistic errors in both formal and informal writing. It serves as a functional guide that will take your flawed writing and fix it, elevating it to high professional or academic standards. Not only that, but once you review your errors and the ways in which WhiteSmoke has corrected your errors (through the error explanation tool) , you'll be receiving your own private English tutorial – look at each editing and reviewing session as a free learning experience! As translation software, the WhiteSmoke program will also give you the option of writing in your native language and then translating what you have composed into coherent, flawless English writing. Our full-text translating service uses advanced statistical machine translation (SMT) technology that enables you to fully translate your document with a simple click. Alternatively, if you would rather attempt writing in English, the program will offer you access to a multilingual dictionary: Not sure of a single word? Simply type it into the translation dictionary for a quick answer. 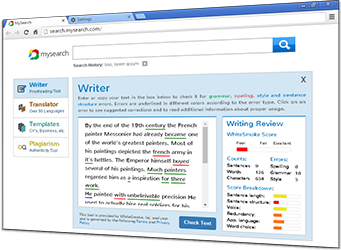 Additionally, you can download WhiteSmoke's toolbar and have access to FREE on-demand grammar check, spell check, style check, translating, and English lessons. The toolbar is one simple way to benefit from our English language correction program. Other services we offer include automatic grammar checking of all outgoing Outlook emails, correction of regular and contextual spelling errors, writing tips, alerts that inform you of missing words and word repetitions, and other important services for people learning English as a second language. Our software is so comprehensive that you'll never need to rely on other spell checkers, grammar checkers, or dictionaries ever again. Nor will you have to spend money on expensive translation or editing services. We also offer hundreds of ready-to-use letter templates to help you compose flawless business letters, cover letters, academic acceptance letters, letters of recommendation, and even personal letters. For ESL students, these letter templates won't just be a time saver, but could dramatically impact their academic or professional future, not to mention help them with learning English. When it comes to writing important documents, you need to make sure that your writing reflects who you are – an intelligent, capable person. Don't let your ESL barrier get in the way of your ambitions!